German POWs working in Aroostook County. TEMPLE - In 1944, the U.S. Army Air Base in Houlton became the site of a Prisoner of War internment camp for German soldiers captured in North Africa and France. The POWs could not be forced to work, but could volunteer. Those who wanted to work helped the local farmers harvest peas, pick potatoes and cut wood in the forest during winter. 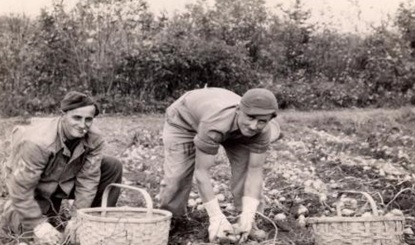 In the fall of 1945, Hank Lunn's father decided to request prisoners to help with the potato harvest because the people he usually hired were not available due of the war. As a 13-year-old boy, the arrival of German soldiers, who may have killed some of our neighbors, was fearsome. Lunn's young mind was not certain it was a good idea to have the “enemy” on the farm. From Foe to Friend tells the personal story of what the experience was like to have German soldiers working on the Lunn family farm in Littleton, a town in Aroostook County. Lunn's story will be presented on April 28 at 2 p.m. at the Temple Town Hall. The event is sponsored by the Temple Historical Society and is free of charge to the public. There will be a question and answer period following the presentation. Refreshments will be available and hosted by the Temple Girl Scouts.